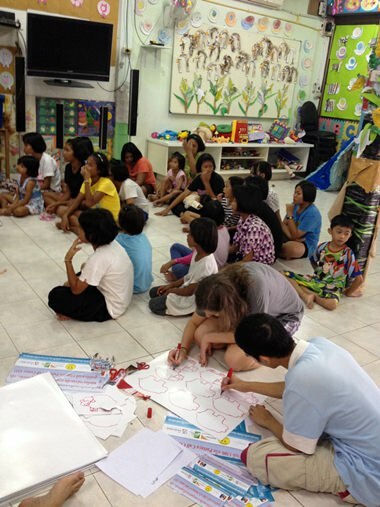 I have now been helping out at the Pattaya Hand to Hand Foundation for a good three months on a weekly basis, and have been enjoying every minute of my time there. Every Saturday, my friends and I go to the foundation from around two in the afternoon until five. 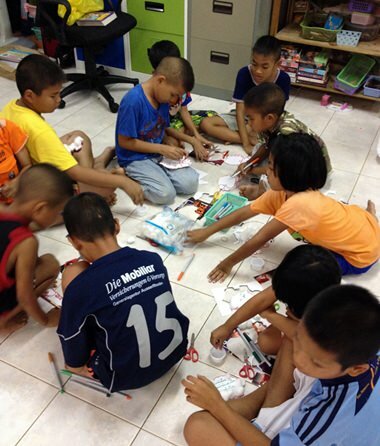 We help out the staff by stocking up food to be sent to Pattaya slums, playing with the children, and preparing art supplies for them to use during the pre-school classes. We are always welcomed by the kids and staff who greet us with warm smiles and embraces, and it never ceases to amaze me how much the children show their appreciation for those who come by to visit them. Children gather to hear Ms. Margaret read wonderful stories from the bible. In the first hour, we make our way to the little garage located just a few meters away from the main room which contains with toys, clothes, stationary supplies, diapers, toiletries and cans, boxes, and packages of non-perishable foods. The faculty staff hands us plastic bags filled with about 1 to 2 kilograms of rice which we then complete the packages with cans of fish soup, packages of instant noodles, cooking oil, and pancake mixes that last a week for the Pattaya slum families. 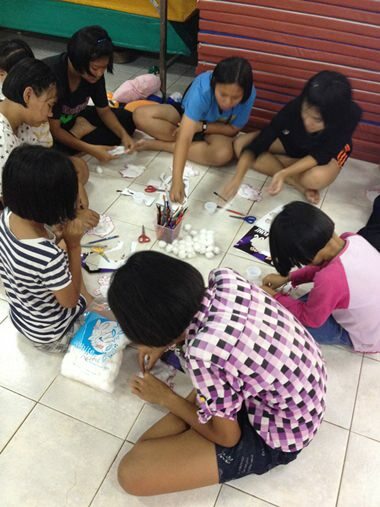 The next hour follows with us preparing art supplies for the children to use for their weekly art projects. Our preparation process often includes tracing and cutting pieces of paper with simple shapes which the kids use later on to create beautiful artwork. At this time, the children surround us with much interest of what we are doing and some even eagerly offer to help us trace a few of the required shapes! Around the time when we have finished our tasks, the Hand to Hand teachers round up all the children for a short story, which we sit and listen to as well. The stories are diverse, interesting, and always come with a moral lesson which never fails to grab the children’s fullest attention. Afterwards, the hungry kids are treated to light snacks which brings their and our day to an end at Hand to Hand. A goodbye is never easy as the children give us signs of heartfelt thank you and waves as we leave the foundation; and we are as always, eager to return in the following week. Hand to Hand has become the best part of my weekends, as it has allowed me to become a more open and understanding person who perceives life in a different light. Through the progressive amount of time I have spent with the Pattaya children, I am truly beginning to see the substantial difference between their lifestyle and mine. 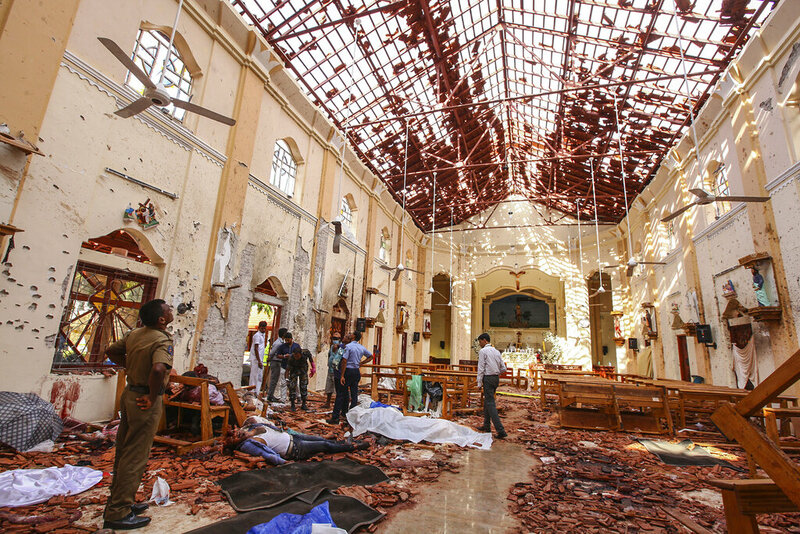 I now understand that to save the defenseless children, action is essential, which is why I’d like to continue voicing out on behalf of them, the problems of child exploitation and the importance of taking small steps to save each individual from the daunting cycle. 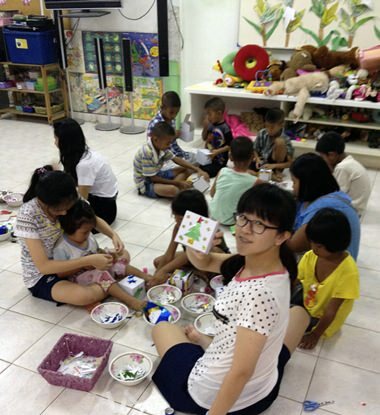 The children unleash their creativity through the art activities done on a weekly basis. Hand to Hand gives these children a chance to make friends and spend a day of no worries, simply joy and fun. 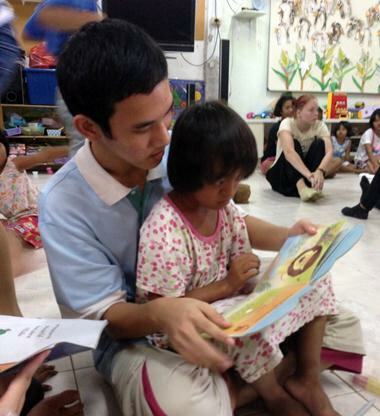 The kids love when we read story books to them, especially in English! My friends and I joined the children in making beautiful boxes in preparation for Christmas!